A poultry farmer whose contaminated eggs caused a salmonella outbreak at a Birmingham hospital has been arrested over the death of a man in Austria. 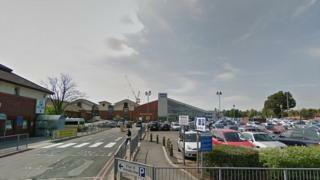 Five patients died at Heartlands Hospital in Bordesley Green and the bacteria was traced back to eggs from factory Bayern Ei in Bavaria, Germany. The same source of salmonella is blamed for the death of a 75-year-old man. Factory owner Stefan Pohlman is in custody accused of grievous bodily harm causing death, said a German lawyer. The salmonella outbreak at Heartlands Hospital between 25 May and 18 June 2014, saw 32 staff and patients infected. A report found it directly caused the death of one patient. It played a part in other deaths because inadequately equipped wards, unmonitored food preparation and poor cleaning helped it spread, the report stated. German prosecutor, Theo Ziegler, said the wealthy businessman is being held on suspicion of grievous bodily harm causing death - due to harmful substances. BBC Midlands Today discovered 60,000 contaminated eggs from Bayern Ei got to England last month but were destroyed before they entered the food chain.